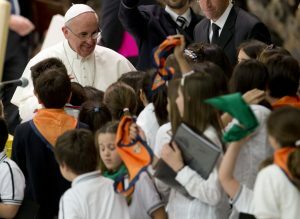 Pope Francis met with students and teachers from Italian and Albanian Jesuit schools in Rome in June 2013. At the sight of the enthusiastic young people, the Pope spontaneously entered into a question-and-answer session with the students. He discarded his prepared speech, saying it would be too boring, opting instead to touch on just a few points, and then spend the rest of the time answering the students’ questions. It was an occasion for young people, teachers and parents to reflect on the Jesuit charism, particularly in the area of education. The Pope is well-versed in this field for, as a Jesuit, he spent a number of years teaching literature, psychology and other subjects at Jesuit schools in Argentina. Here is a translation of part of his address: “I would like to tell you something about our founder Saint Ignatius of Loyola. In the autumn of 1537, when going to Rome with his first companions, he asked: ‘If they ask who we are, what will we respond?’ Instinctively they replied: ‘We’ll say we are the Society of Jesus.’ This was a challenging name, indicating a relationship of close friendship, of total affection, for Jesus, whose footsteps they wanted to follow. Saint Ignatius and his companions understood that Jesus had taught them how to live well; how to create a life that would have profound meaning, joy and hope. They also understood that Jesus is a great master and model for life. Jesus not only taught them, but also invited them to follow his path. Now if I were to ask you: ‘Why do you go to school’, what would you answer me? There would probably be many responses, according to each of your feelings and outlooks. Perhaps they could be summarised by saying that school is one of those environments where we learn to live; that is to become mature men and women, capable of making a good journey in life. “How does school help you to grow? It helps you not only in the development of your intelligence, but by an integral formation of all of the components of your personality. The principle element of education is to learn to be generous. Saint Ignatius taught us that magnanimity is the virtue of the great and of the small – Non coerceri maximo contineri minimo, divinum est (Not to be constrained by the greatest, yet to be contained by the smallest, is divine). Magnanimity enables us to look to the horizon. It is to have a big heart, to have a great spirit, and to have great ideals. It is the desire to do great things to respond to that which God asks of us. However generosity is truly shown in doing well the simple things – the daily chores and responsibilities, and the ordinary encounters with people. It is doing the small things every day with a big heart open to God and to others. So we tend to a human formation aimed at generosity. School not only expands your intellectual dimension, but also the human heart. In a particular way, Jesuit schools are attentive to developing human virtues such as loyalty, respect, faithfulness, commitment. “I would like to reflect on two fundamental values: freedom and service. Sometimes we think freedom is doing whatever we want; or venturing into high-risk activities to experience a thrill or to overcome boredom. This is not true freedom. Freedom means knowing how to reflect on what we do, discerning that which is good from what is less than good, and behaving in a way that leads to growth. It means always choosing well. We have a freedom for the good. And, in choosing this, please do not be afraid to go against the current, even if that seems difficult. To be free, to always choose the good, is challenging, but it will make you into someone who is strong, and who can face life with courage and steadfastness. The second value is service. In Jesuit schools, you participate in various activities that encourage you not to be closed in on yourselves and your little world, but to open yourselves to others, especially the poorest and neediest, to work to make the world a better place. Be men and women with others and for others, true champions in the service of others. To be magnanimous with interior freedom, and in a spirit of service, is necessary for spiritual formation. Always love Jesus Christ more deeply. Our lives are a response to his invitation. You will be happy and you will build your lives well if you will know how to respond to this call. Feel the presence of the Lord in your lives. He is close to each of you as your companion, as a friend, who knows how to help and understand you, who encourages you in difficult moments and who never abandons you. In prayer, in conversation with him, in the reading of Scripture, you will discover that he is truly close to you. Learn to read the traces of God in your lives. He is always communicating with us, amidst the realities of our time and our daily existence. It is up to us to listen well. “May I speak directly for a moment to our educators – Jesuits, teachers, school staff and parents? Do not be discouraged by the difficulties that the educational challenge presents. Educating is not a job but an attitude. It is a way of being. To educate well, we need to step out of ourselves and be among young people, to accompany them in the stages of their growth, placing ourselves at their side. Give them hope, and confidence for their journey in the world. Teach them to see the beauty and the goodness of creation and of humanity, which always retains the imprint of the Creator. Most importantly, be witnesses with your lives. Educators –Jesuits, teachers, school staff, or parents – convey knowledge and values with their words, but they make a difference when they back up words with their personal example; that is with the coherence of their life. Without this coherence, it is not possible to educate. You are all educators; there are no proxies in this field. 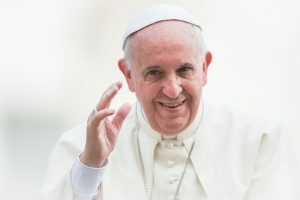 Pope Francis then answered some ten questions, including how to deal with doubt, how to live with hope in a troubled world, and whether Christians should be politically active. One girl asked why he chose not to live in the apostolic palace. He explained that it was not just a question of wealth and him trying to be virtuous, but rather it’s for my mental health. Living in an isolated setting would not do me any good. He described how he prefers to live in the thick of things, among the people, and that he tries to live simply, not to have many things and to become a bit poorer like Christ. He urged everyone to try to live more simply: In a world where there is so much wealth, so many resources to feed everyone, it is incomprehensible how there can be so many hungry children, so many children without an education, so many poor. Extreme poverty in the world is a scandal and a cry for help. That is why each one of us must think how we can become a little bit poorer and more like Christ. One teenager told the Pope that he was trying hard to believe in God and be faithful, but that he often struggled with doubt. Pope Francis replied: The journey of life is not easy, because it requires juggling the need to move forward with the importance of taking time to reflect. If we go too quickly, we’ll get tired and won’t be able to reach our destination, yet if we stop or take our time, we won’t get there either. Life’s journey is truly the art of looking at the horizon, reflecting on where I want to go, but also putting up with the fatigue from this journey. Don’t be afraid of failure. The problem with the journey of life and faith isn’t falling; it’s not getting back up. Get right back up, immediately and keep going. Don’t embark on this journey alone, either, because that would be awful and boring. Go as a community with friends and people who care about you very much, because that will help us get to our destination.